These instruments are designed to measure the small concentrations (0-5 mg/L) of organic compounds typically found in natural water and treated drinking water. Most employ and acidify-purge step to remove inorganic carbon (e.g., carbonates), followed by high temperature combustion and IR detection of the carbon dioxide produced. 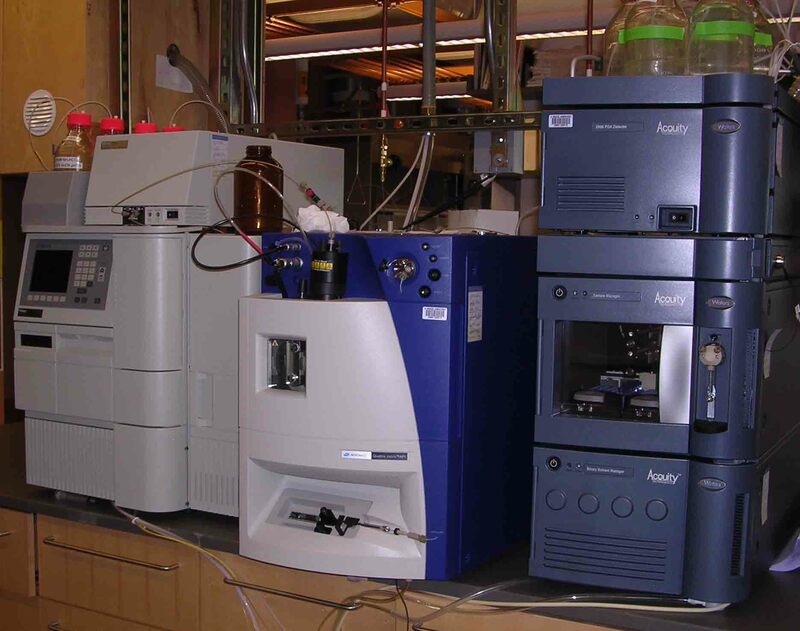 The Environmental Engineering program has five total organic carbon (TOC) analyzers, most of which are available for general use. All but the Dohrmann are based on the high-temperature combustion method. The Shimadzu 5000 in 308 Elab II is most commonly used for drinking water and clean surface water samples. 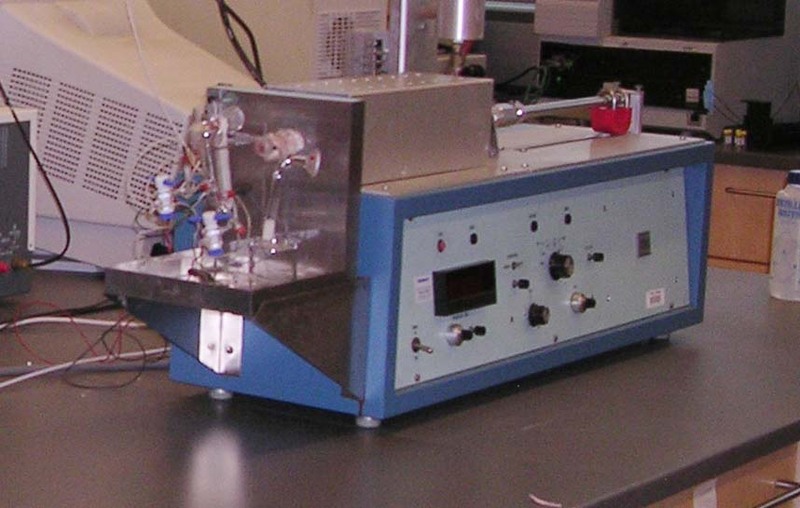 There is a similar instrument (model 5050) in Room 208 dedicated to groundwater research. For those interested in total nitrogen analysis, the Shimadzu TOC/V is the appropriate instrument. This is located in room 308 and can measure TN and organic carbon simultaneously. All of these Shimadzu instruments are equipped with PC-based data systems, that can be used to store and re-calibrate results. A fourth Shimadzu (model 4000) is occasionally used for on-line analysis. This is a skid-mounted unit located in the corner of room 308. The Dorhmann instrument, an ambient temperature UV/persulfate analyzer, is not commonly used at this time.. All analyzers are equipped with autosamplers except the Beckman. This last instrument is quite old, but well suited for certain specialized needs not requiring low level analysis (e.g., sludges). These instruments are capable of measuring the total amount of organic chlorine, bromine and iodine in water samples (wastewater, natural water, drinking water). They all employ adsorption to activated carbon for sample pre-concentration and separation of organic halides from inorganic halides. The carbon is then introduced into a high-temperature combustion furnace. The resulting HX is trapped and analyzed for total halogen by precipitation of AgX 2 in a microcoulometer. It is also possible to trap the HX and measure the halide by specific ion analysis (e.g., IC), thereby determining TOCl, TOBr, and TOI. A Euroglass PC-controlled TOX analyzer is available for use in 301 Elab II (Bay E). This is the more commonly used of the two. It uses only oxygen as a carrier/reactive gas, and is therefore better suited for subsequent specific halide analysis by IC. A Dohrmann DX-20 total organic halide analyzer is also available in for general use. 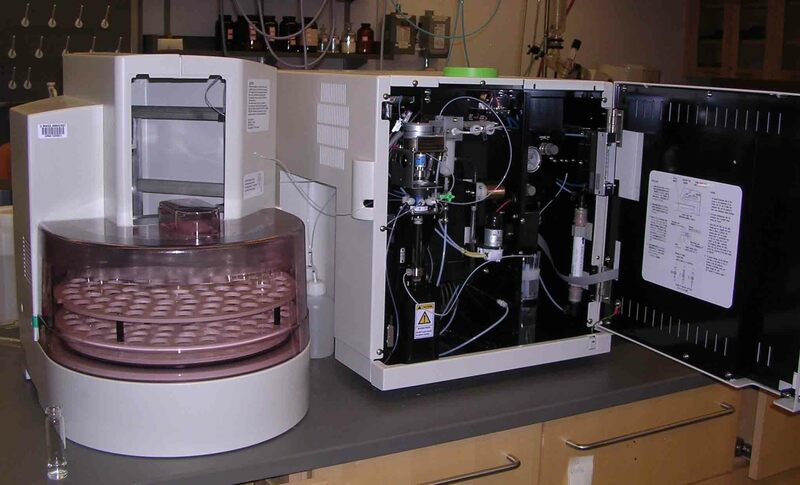 Both analyzers include a carbon adsorption module for pre-concentration and removal of inorganic halide. 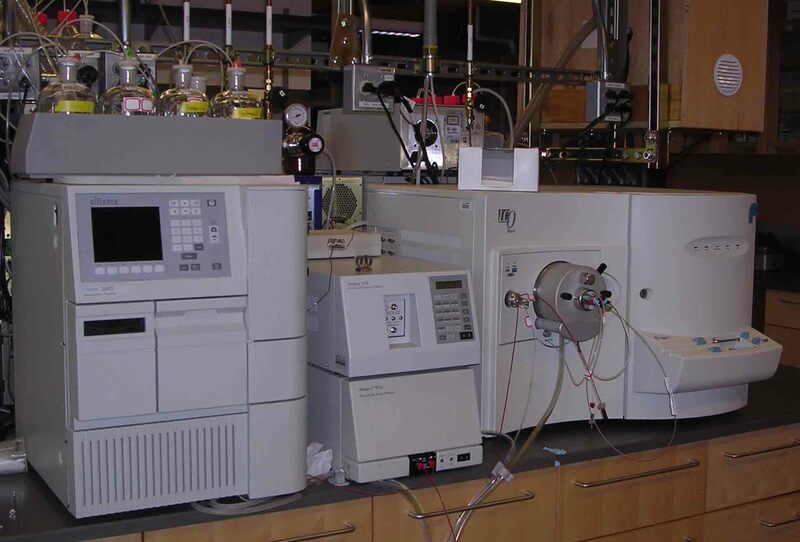 Gas chromatographs are commonly used in the EVE program for analysis of trace organic contaminants. These include organic solvents, hydrocarbons, halogenated and non-halogenated disinfection byproducts, pesticides, pharmaceuticals and endocrine disrupters. Nearly all GCs in use are equipped with capillary columns, flash vaporizations injectors and electron capture, flame ionization or thermal conductivity detectors. The use of mass spectrometers as detectors for gas chromatography represents a powerful addition to standard GC for identification of unknown contaminants or verification of suspected compounds. 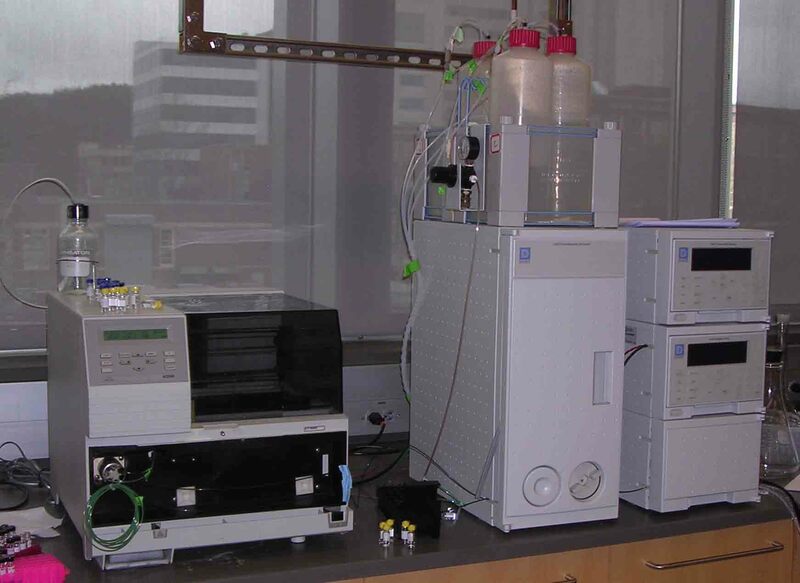 These GC/MS instruments are more complex to operate than GCs, but their use has revolutionized environmental engineering. There are several types of mass spectrometers, each with its own set of advantages and capabilities. Single quadrupoles are simple and inexpensive, but their abilities to provide unambiguous identification are limited. Ion traps can be quite sensitive and their design often allows for tandem mass spectrometry (e.g., MS/MS). Time of flight mass spectrometers have much higher resolution, allowing the assignment of unambiguous molecular formulae. 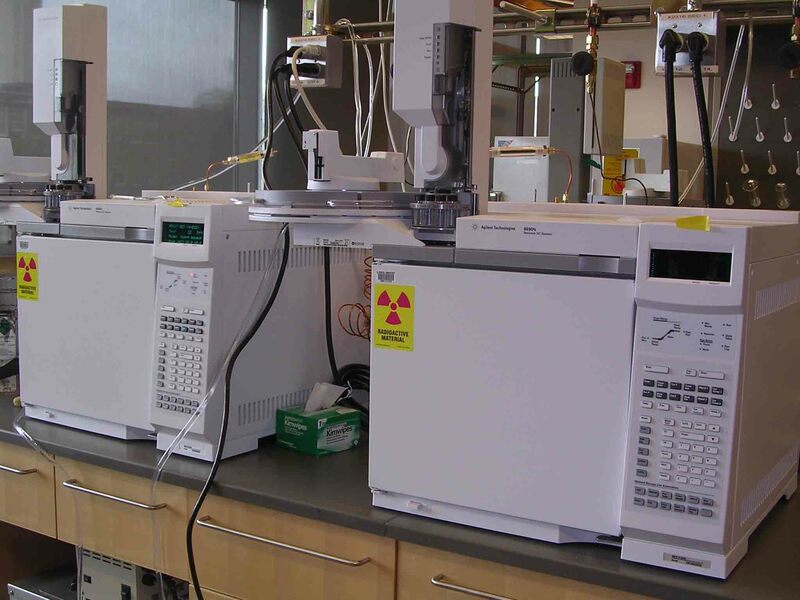 Three GC/MS instruments are available in the EVE labs. The newest and most selective is the time-of-flight instrument (Waters GCT, or GCTOF). This is capable of mass resolution of 10 ppm. Most GC/MS work (e.g., nitrosamines) is currently done with the GCT. 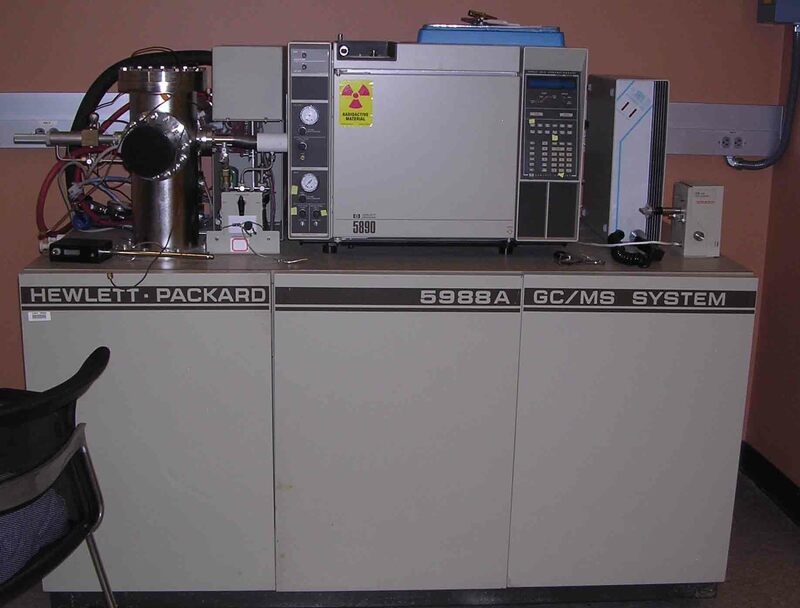 In addition, there is a Hewlett-Packard 5988 Gas Chromatograph - Mass Spectrometer, which is a single quadrupole unit. It is capable of electron impact ionization, as well as both negative and positive chemical ionization. 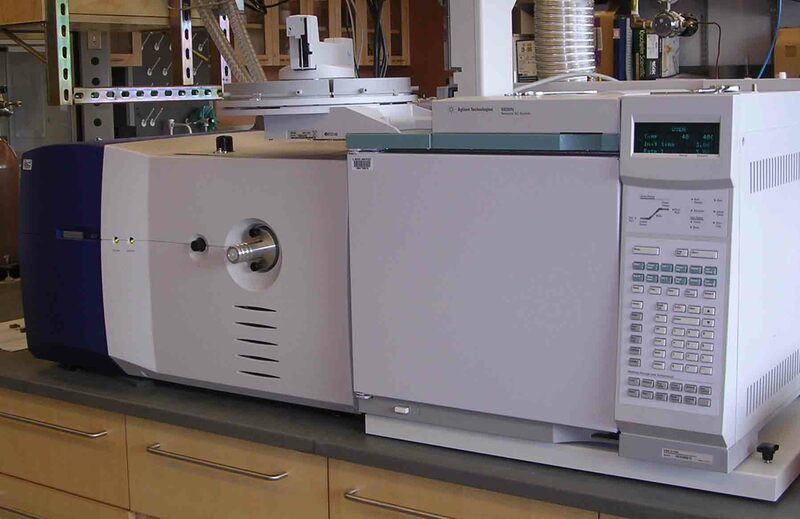 This instrument is equipped with a pyroprobe, and was last used for Pyrolysis GC/MS of NOM samples. Both the GCTOF and the HP 5988 are located in 301 Elab II. In addition, there is a Varian Ion Trap GC/MS on loan to Public Health. This instrument is in Goessmann 107, and can be made available to EVE researchers as needed. Liquid chromatographs (LCs) are better suited for analysis of highly soluble (hydrophilic) organic contaminants than GCs. There are a group of HPLCs designed especially for ion analysis, called ion chromatographs. These use ion exchange columns and conductivity detectors. In general, HPLCs are also better for compounds that would decompose in hot GC injectors. Recent advancements in HPLC technology have helped to overcome some of the drawbacks that had previously limited their use, poor chromatographic resolution, detector insensitivity, incompatibility with MS. HPLC, especially with MS detection has become an essential tool in environmental engineering. Available Instruments : Three Waters High Performance Liquid Chromatographs (HPLCs) and two Dionex Ion Chromatographs (ICs) are available in the EVE labs. Two of HPLCs are Alliance units that have autosamplers and dual pumps for binary solvent programming. Each has a diode array detector and one also has a fluorescence detector. The third instrument is a new higher pressure LC, called an Ultra Performance Liquid Chromatograph (UPLC). This is a Waters Acuity model, which promises higher resolution than the standard HPLC. All three HPLCs can be used as an inlet to a mass spectrometer (LC/MS). 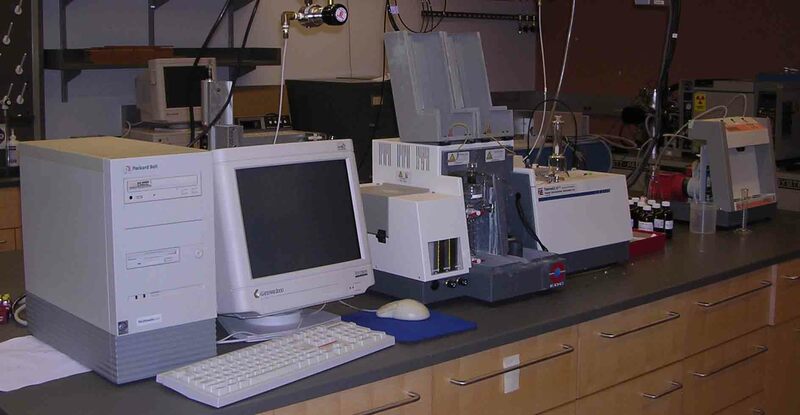 The older Alliance HPLC is situated so that it can feed directly into EVE's ThermoQuest Ion Trap MS. This instrument is capable of LC/MS, LC/MS/MS up to LC/MS 10 . The other Alliance and the Acquity can feed into a triple quadrupole mass spectrometer (Waters Quattro Micro). These LC/MS combinations are frequently used for analysis of perchlorate and pharmaceuticals in water. The Dionex ICs have a conductivity detector employing chemical suppression technology. For most inorganic analytical applications, the ICs are the appropriate choice, whereas the HPLCs are most commonly used for organic analytes.